Call 510-848-0181 for reservations. Limited seating. “Inside the Free Speech Movement,” a video by Linda Rosen and Jai Jai Noire, features BHS oral history interviews with major participants in the Free Speech Movement. It covers civil liberties and civil rights issues that led up to and were launched by the FSM and how it became so successful. The Student Rights Movement, which began in Berkeley, spread throughout the United States and the world, influencing the 1968 Paris student uprising and Prague Spring. Berkeley’s anti-Vietnam War protests, which followed on the heels of the FSM, demonstrated how youth could successfully challenge the status quo and emboldened others to follow suit. 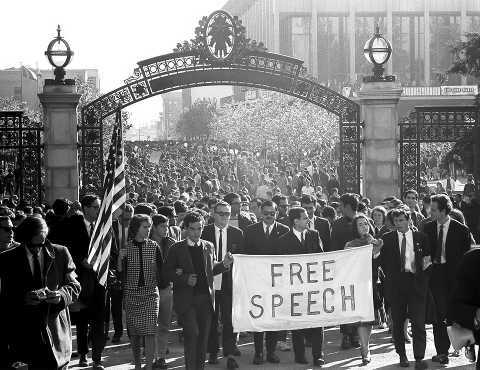 The Free Speech Movement permanently changed Berkeley and is also pertinent to today’s events.